Hey y'all! I hope you had a lovely Valentine's Day. My social media was just flooded with love--it was a nice change from the usual negativity I see lately. 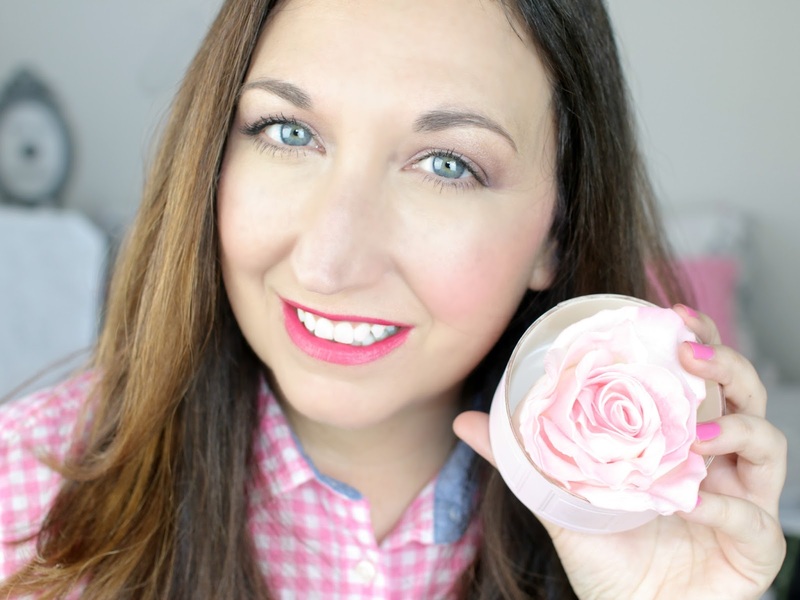 I loved seeing all of the roses, and speaking of roses, remember a few weeks ago when I shared my review of the Lancome La Rose Blush? See the original post here. I talked about making my own and a few of you suggested that I do it, so welcome to today's post! Since the original Lancome La Rose is $60 and sold out in most places, I had to make a comparable diy version. And it is SO easy. 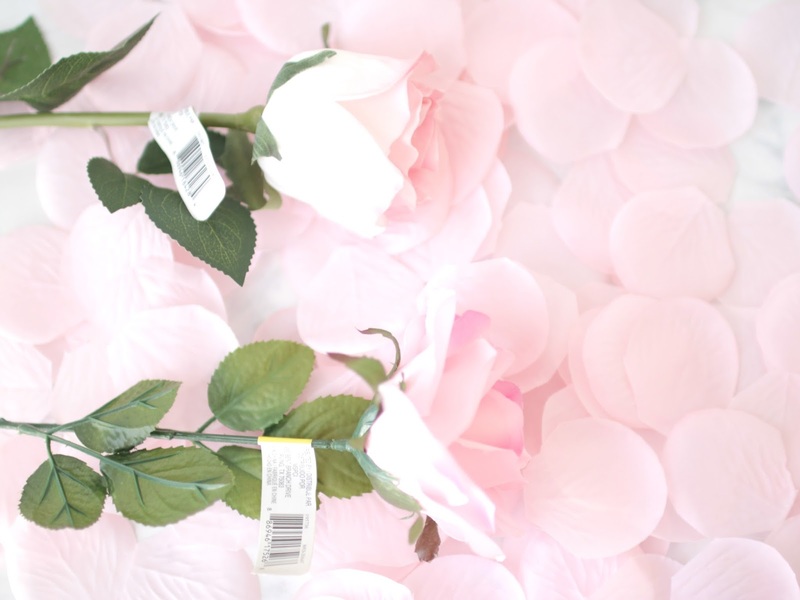 Choose your rose. I wanted one that closely resembled the original Lancome rose in color. 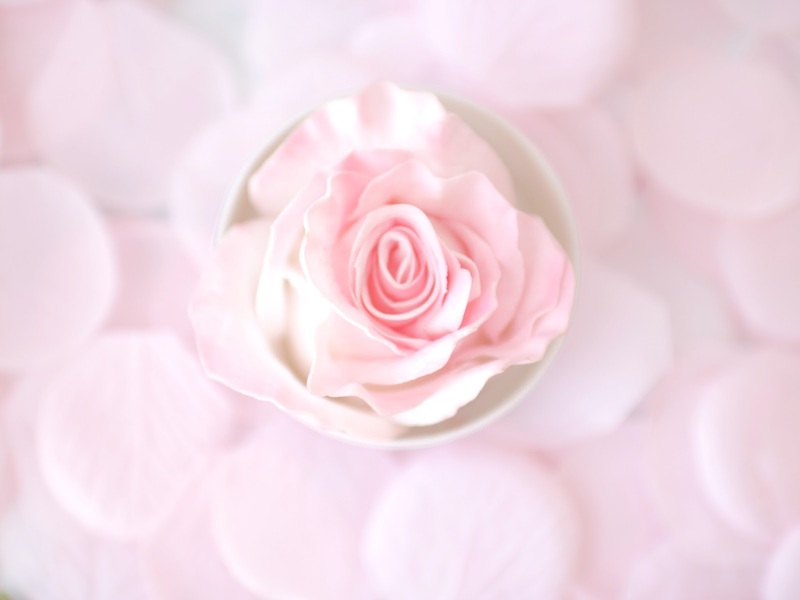 Make sure the rose is clean and free from dust. I used a blast from a keyboard air cleaner for mine. Remove stem and all leaves. TIP: Make sure the rose fits in the small box. Choose your color. I have an eyeshadow from Maybelline in Seashell that is pretty much a dupe. But for those not into highlight, you can choose an eyeshadow or blush. TIP: If using blush/shadow, make sure the shade matches the rose in color as well. 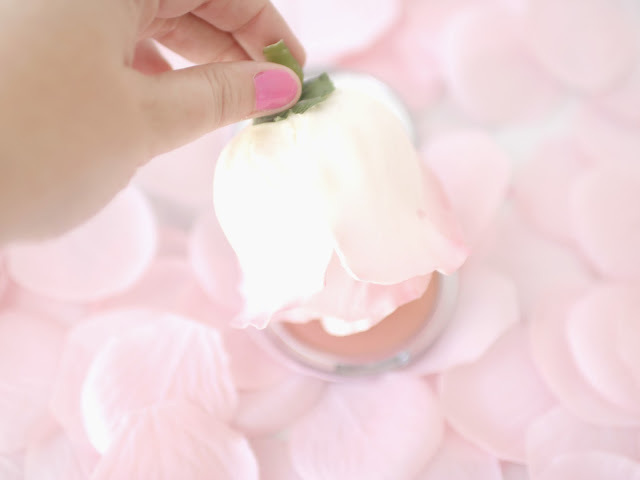 METHOD 1: Just dip the clean rose into a blush/highlight/shadow and swirl around to coat the top. Just to apply to face, use a brush. METHOD 2: Add a little rubbing alcohol or makeup setting spray (not the dewy kind) to a small bowl and scrape into it your shade. You should have more color than alcohol. Mix well. I used the blush for this demonstration because it photographed better. 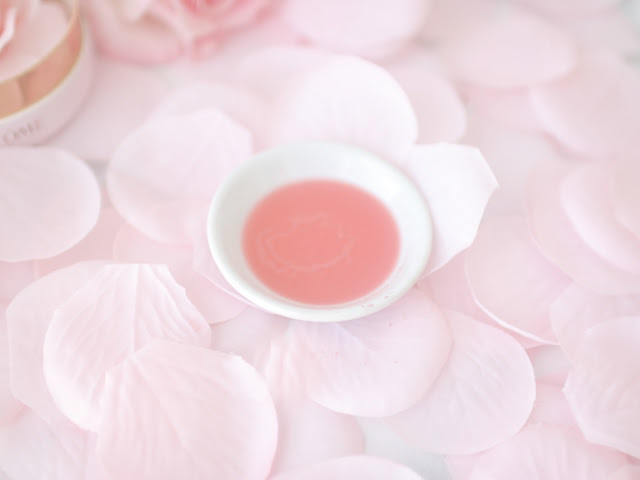 Using a small brush, paint the top of the rose petals with your mixture and allow to dry. I used a different rose for this one, since it was blush, so you could tell the difference. Paint box pink if desired. The rim on the original Lancome is rose gold, so you can use a paint marker for the edge to mimic it. Hot glue the rose to the bottom of the box. Use a brush to apply product to face. Keep the lid on when not in use. METHOD 3: Pour a small amount of rubbing alcohol into a spray bottle. 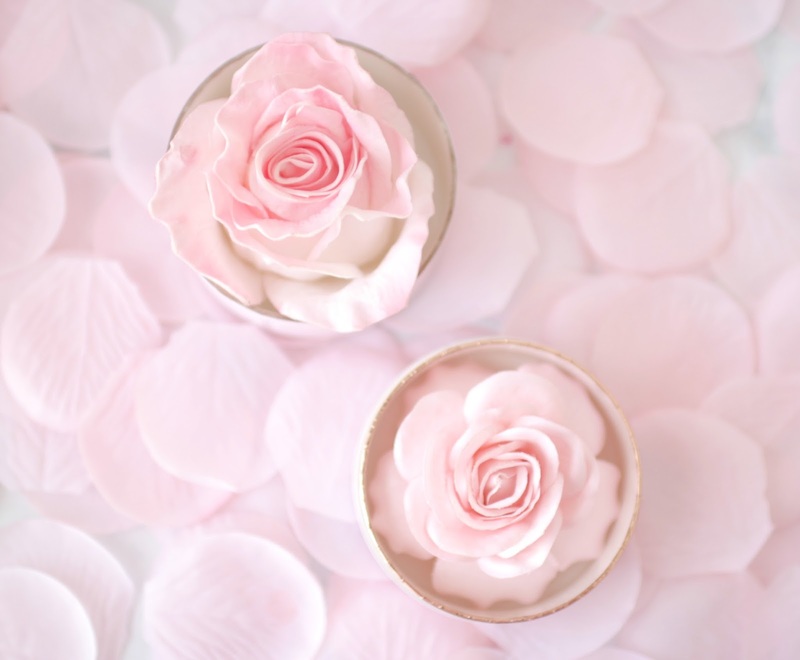 Spray the rose gently and then brush pigment on top. Allow to dry. METHOD 4: Mix makeup setting spray with the pigment and spray on rose. Other things I tried but didn't like as much: vegetable glycerin with color (too heavy/greasy), coconut oil with pigment (too thick, no matter how I did it), painting just individual petals (like those in the background of my pics) and rubbing them on my face (kinda silly, but a good idea for travel but there's paper blush/highlight already). I'm wearing the blush and the highlight. It is very natural-looking on the skin. I found Maybelline Seashell to be a pretty good dupe. On the first finger is the Lancome and on my middle finger is the Maybelline. And here they are side by side, with the Lancome on the bottom. Pretty similar! What do you think of this DIY? PS: I was on PopSugar today--read it here. I love that you recreated the Lancome! I might make one just to have something pretty on my vanity! Such a clever idea! 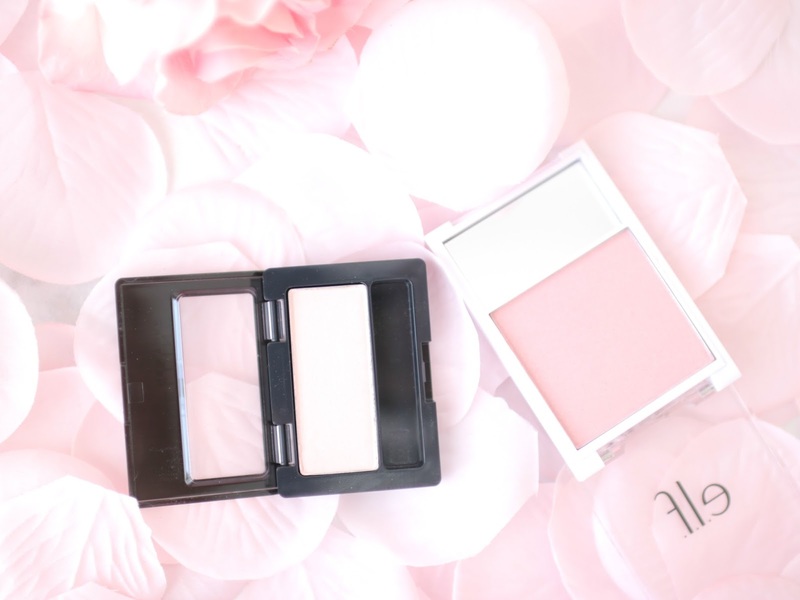 Both are incredibly beautiful and look lovely on a vanity, but I 'll take the dupe any day over the $60 version! This is gorgeous!!!!! 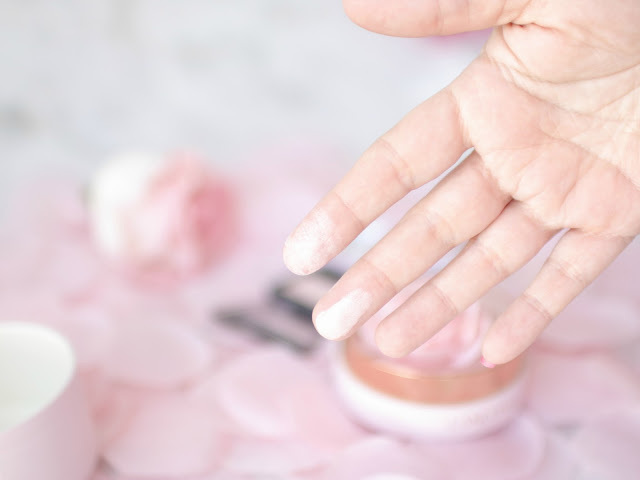 I say this every single time, but you are the best DIY beauty person out there. I cant even tell which one is which in the end. Wow, I can't believe how well that came out - such a good DIY! Elle!! This is amazing! It looks perfect and is so much more affordable! You are just so good at this! that is pretty cool. I will show it to my girls. Otherwise, I'm likely to pick colors from one of my favorite sports teams. (Sorry about the Falcons). What an amazing DIY! I almost bought the Lancome one when you shared it because it's so gorgeous to look at. I will have to try this! Oh wow, it's unbelievable that you managed to DIY this, Elle! You are the Queen of DIY indeed! You are seriously the DIY QUeen. The things you come up with and all you do...seriously impressive! This is beautiful! What a fun DIY! I love all the different method options you have and the end result! I've heard such "meh" reviews on the Lancome blush. Such a shame because it's seriously stunning to look at! What a well thought out DIY! This is a great idea! Esp for people not willing to spend the hefty price tag of the Lancome one! Thanks for sharing! Elle you're DIY'S are so creative and this project is so beautiful! Amazing job! oh Elle, this is so pretty and such a lovely idea! Hope today is as lovely as yesterday you gorgeous lady!! I loved all of the positivity yesterday as well! And I swear, you are so creative! I don't think that I ever could have thought about recreating that beautiful blush, but you did such a great job with it! That's amazing how similar the two are! You did a great job on this DIY! How cute!! I love the idea of making this as a diy, the Lancôme one is beautiful but so expensive! Yours looks so similar too! I love this! What a pretty DIY! And really not terribly complicated to replicate such a beautiful product! Honestly, I like yours better. The rose part is pinker. Sometimes, what is expensive is not what is good. Love this DIY! Wow impressive! So delicate and pretty and the best part is it's a huge money saver! You are so talented at these DIY's!! Wish I was that creative and crafty! Wow! This is so pretty! Though I'd never use it cos I wouldn't want it to run out! How crafty are you, lady!? 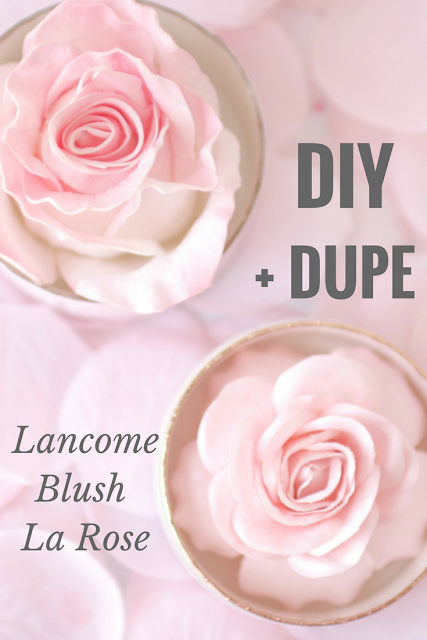 I love this- such a great dupe! They do look quite similar! You're the queen of beauty DIYS! This is so pretty, and yours looks just like the lancome! Impressive! I seriously love that you made your own! You are amazing at DIY's! Great job Elle - it's so pretty and definitely on the money! Such a lovey DIY. liked it. This is SOOO pretty!!! I love it!! Wow your DIY dupe actually looks very good! 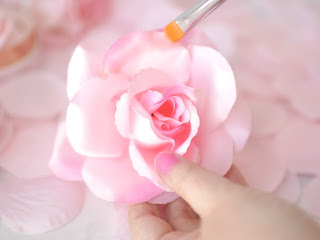 With the alcohol method does the highlighter adhere to the petals well? This is a very lovely diy. Dammit, Elle! You are literally The Coolest! Who else thinks to DIY something like this?! You are amazing, girl! Also, can I just say yours looks prettier than the Lancome? Love it! Wow I absolutely love how this turned out. Great DIY. oh wow! awesome idea! you are so creative! What a fun dupe, I might have to try this next weekend, thanks for the suggestion! So happy to have you back Elle, I hope you are doing well. I need that Instant Magic Facial Dry Sheet Mask. I love all of the suggestions.